The European Food Safety Authority, EFSA, has recently announced that they will again review the safety of aspartame, a controversial artificial sweetener that is a combination of two isolated amino acids and methanol. This new review comes after the agency whitewashed and glossed over the studies of the Italian Ramazzini Cancer research institute that had shown aspartame to be a carcinogen. Aspartame's approval by the US FDA in the 1980s, says Betty Martini of Mission Possible World Health International, was a political decision, taken over the objection of the FDA's own scientific panel. Studies used to obtain approval were sanitized, to hide damaging effects the sweetener had on laboratory animals and eventually, Donald Rumsfeld was brought in to push through the approval. The European Food Safety Authority has recently published a number of studies that their new review will be based on, all "in the name of transparency". But they are missing all the good stuff, says Martini. Don't miss a word of it. This includes the history and statements from the Task Force on aspartame, which were so detrimental to G. D. Searle they sued to get them removed from the record. There are no secrets. They went to every length to hide the fraud. The defense team hired the Justice Department prosecutors when the FDA called for Searle to be indicted for fraud. With the constant stream of "independent" studies showing aspartame's deadly effects from heart attacks to cancer Parliament and EU said another review was needed. Of particular interest is a Danish study on 60,000 women showing aspartame can jump preterm birth rates 78%. Parliament has every reason to be concerned. The FDA admitted aspartame causes birth defects, and then sealed the records. We recovered and restored them to the Bressler Report. Pediatric professor of genetics, Dr. Louis Elsas, testified before Congress his concerns, yet the bill to put a moratorium on aspartame and have NIH do independent studies on the problems being seen in the population like effect to the fetus, drug interaction and behavioral problems in children, etc, never got out of committee. Dr. Herman Koeter, former EFSA head released his statement that they were pressured by industry to hijack science, stating in particular the Ramazzini studies which showed aspartame is a multipotential carcinogen. FDA toxicologist, Dr. Adrian Gross, testified before Congress aspartame violates the Delaney Amendment because of the cancer shown in original studies, admitting that based on this no allowable daily intake could be set. EFSA's conflict of interests has recently been exposed as well. It was anticipated that EFSA would show their loyalty to industry again, and omit the facts and independent studies. We knew we had to advise Parliament what was going on in advance. On our web site, www.mpwhi.com you will see a button for "peer reviewed research" at the top of the page. The banners on the first page present the congressional records, the UPI investigation exposing the corruption, the FDA Board of Inquiry report revoking aspartame's petition for approval, Dr. John Olney's 49 page report to the BOI explaining it will cause birth defects and the "Complete Bressler Report" with the teratology studies returned that had been hidden for over 30 years admitting birth defects. The "Report for Schools" contains the evidence needed to show aspartame is a teratogen causing birth defects and mental retardation. On the top buttons find FDA's report of 92 symptoms from seizures to blindness, on their stationery. "Aspartame News" goes back for years and even has the damning CDC investigation, which was sent to EFSA but not posted. EFSA showing only the industry side of the picture is fraudulent since they deliberately conceal its toxicity. With the whole picture in front of them they chose to support industry. EFSA asked for all records in PDF form and not only were these resent by Lane Shore, Mission Possible Chicago, but he did in-depth research and sent them more damning records. James Turner, renowned DC Consumer Attorney, Naders Raider and author of The Chemical Feast, joined with neuroscientist John Olney, M.D. in 1974 and fought to prevent FDA approval of aspartame. Dr. Olney did studies on aspartic acid, which comprises 40% of the aspartame molecule, finding it caused lesions in the brains of mice. His report to the FDA Public Board of Inquiry predicted that aspartame would produce serious problems, including birth defects, damaging the brains of babies and children, a serious subtle side effect that no one has seriously looked for. "If this is what EFSA calls openness and transparency it fails the laugh test. It is the false history we hear from the manufacturers of aspartame over and over again. These studies were so corrupt the FDA attempted to have the company, G. D. Searle, indicted for fraud. The Department of Justice assigned two attorneys, Sam Skinner and William Conlon, to prosecute Searle, whose offences were so blatant as to be indefensible. Searle's defense attorneys, Sidley & Austin, killed the government's action by hiring the prosecutors, the statute of limitations expired, and the case forever died. Years later Skinner publicly apologized for his actions in the aspartame case, when he faced U.S. Senate confirmation for a cabinet post. "Where in EFSA's openness and transparency strategy is the FDA special task force report condemning Searle's studies as a violation of law? Where is the FDA internal report on cancer-causing byproducts created by aspartame consumption? Where is the FDA letter seeking a grand jury investigation of Searle studies, including aspartame studies on monkeys, which had grand mal seizures after consuming aspartame? Where is the Public Board of Inquiry ruling banning the sale of aspartame because of the aspartame animal studies in which statistically significant numbers of animals got cancer? This report was subsequently overturned by a new FDA Commissioner who had to leave FDA because of conflicts of interest. Where is the scientific analysis of the Commissioners ruling that is filled with scientific misstatements, non-sequiturs and false science used to overrule the Public Board of Inquiry? How is it possible for any decision maker to rely on a report that leaves out most of the story? It is not possible. Decision makers relying on EFSA should demand it supply them the totality of the aspartame record, not only the carefully selected, flawed and ultimately false reports from aspartames manufacturers. "In 1970, three years before Searle petitioned FDA for aspartame approval, Dr. Olney was so concerned about aspartame safety that he asked Searle to join him in doing studies in his laboratory where he could show them what aspartame was doing to animal brains. The brain damage was shown and Olney felt there would be no approval, but G. D. Searle did not submit the results to the FDA when it sought approval of aspartame. Where are the studies Searle did showing lesions in the brains of aspartame consuming mice and then withheld? The marketing of aspartame is not because it has been scientifically approved as safe, but through political manipulation and dishonesty. Donald Rumsfeld was hired as Searle's CEO in 1977, and asked to meet with me. We met and I suggested that we create a team of researchers that could answer the troubling aspartame questions one way or another. After six months of dithering, Searle decided against trying to address the dangers of aspartame scientifically. The FDA appointed a Public Board of Inquiry, which held hearings and issued its report in October of 1980. In November of 1980, Reagan won the election for U.S. President and Rumsfeld turned up on President Reagan's transition team. He "called in his markers," words now famous for how aspartame was approved. The new President, who owed Rumsfeld favors, wrote an executive order that made the FDA Commissioner powerless to sign into law the decision of the FDA Public Board of Inquiry to revoke the petition for approval. Then Reagan appointed Arthur Hull Hayes, a physician who worked at the Pentagon while Rumsfeld was Defense Secretary under President Ford, as the new FDA Commissioner. Hayes appointed a task force to review the PBOI ruling. The committee scientists found that the Board position on the cancer causing potential of aspartame was supported by the science and advised Hayes to approve the findings of the Board. Instead Hayes overruled the Board. Where in the EFSA openness and transparency position are the reports of the FDA scientists who reviewed and approved the PBOI findings of the dangers reported in the Searle animal cancer studies? Hayes ruling allowed a potentially deadly excitoneurotoxic drug to be marketed for human consumption. The EFSA finding, which hides from decision makers very important facts they need to know to make sound decisions, if adopted would allow aspartame to spread its harm throughout the world. (The decision is not only whether to permit the sale of aspartame but also how it should be labeled if it is sold.) The Guardian reported that aspartame was effectively approved in England thru a business deal with Dr. Paul Turner, chair of the government committee charged with reviewing aspartame safety, who at the time he served on the committee was also a consultant to the aspartame manufacturer. He did this without the public knowing. 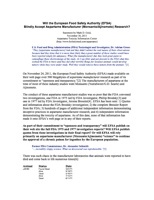 Where are Dr. Turner's recommendations and the facts surrounding it in EFSA's open and transparent posting? These are facts that decision makers and the interested people, including vulnerable consumers, of the world should be told by EFSA. "Continually from 1970, independent study after independent study has failed to show that aspartame is safe, while thousands of consumers have reported heart attacks, cancer, birth defects, obesity, strokes, and other harm occurring after they consumed aspartame. Where in the EFSA posting are the thousands of aspartame consumer adverse reaction reports received by regulatory agencies around the world? Studies suggest DNA damage, increased cancer incidence and cell damage from formaldehyde, an aspartame by-product, all in connection with aspartame consumption. Where are these studies in the EFSA posting? For the 4 decades I've worked to publicize including thorough food labels the dangers of aspartame (with some success, since it never reached its goal of substantially replacing sugar), the studies showing its lack of safety have piled up. EFSA has purported to present, with self-proclaimed openness and transparency, the entire scientific story regarding aspartame. In fact, it has only presented that portion of the story that advances the interest of aspartames manufacturer. It has ignored the rest of the story, which shows the aspartame risks consumers face. Why has EFSA ignored almost every study showing risk? By some estimates, virtually all-independent studies done on aspartame contain critical information about harm? EFSA should not be permitted to get away with presenting as if uncontroverted data that FDA officials, scientists and lawyers repudiated and that one FDA Commissioner called reprehensible, actually favor aspartame. Allowing EFSA's posting to go officially unchallenged could result in Codex using it to validate marketing it in countries where it is now not approved, creating the likelihood that vast numbers of new consumers will be harmed. Parliament and Europe must have the truth aspartame has not been shown to be safe and study after study says it is spreading harm." Dr. Ralph Walton, psychiatrist, did a study on aspartame. Monsanto refused to sell him the aspartame. They were not funding or controlling it, and knew the findings would be made public. The administrator of the hospital who took part in the study had a retinal detachment and lost his vision in one eye. Another subject had conjunctival bleeding. Some said they were being poisoned. The institution had to stop the study. Any honest study on aspartame will show detrimental results. Dr. Walton did research for 60 Minutes when they did an expose on aspartame after Dr. John Olney made world news on aspartame and the brain tumor connection. The aspartame molecule breaks down to diketopiperazine, a brain tumor agent. Dr. Walton's research showed only industry funded and controlled studies ever said aspartame was safe, but that 92% of independent and unbiased peer reviewed research showed the problems. He also said if you removed 6 studies the FDA had something to do with (because of their controversy after approval) and one pro-industry summary 100% of independent studies show aspartame harm. This was sent to EFSA and is on our web site. "I have had a busy psychiatric practice for over 40 years, and for the past 25 years have dealt with the many problems which the artificial sweetener aspartame has caused my patients. It can lower the seizure threshold, leading some patients to have grand mal seizures. For patients with underlying mood and anxiety disorders it can significantly accentuate symptoms. As an excitotoxin I believe that it is a factor in multiple neurologic disorders, including MS and autism. The marked increase in prevalence of these disorders coincides with the introduction of aspartame into our food supply. The failure of the FDA and EFSA to remove this toxin is particularly tragic. Unfortunately these regulatory bodies are apparently responding to tainted industry sponsored research and ignoring the growing number of independent studies identifying multiple problems." "I have been a licensed Texas Attorney since 1971, and served as Assistant U.S. Attorney for the Western District of Texas, U.S. Department of Justice, from 1972 - 1976. In December of 1996, while at the peak of my legal career as the Chairman and CEO of the 18th largest law firm in San Antonio, Texas, I was diagnosed with the first of two brain tumors and had surgery in 1996, 62 days of daily radiation in 1997, and a second surgery in 1998 (in which my pituitary gland was removed). I was on medical disability for 4 years because of the side affects of the radiation. In July 2000, I wrote a research report which documents the causal connection between aspartame and brain tumors entitled: "Aspartame Causes Brain Tumors ... Beyond A Shadow Of A Doubt," which is published at www.dorway.com/lawyer1.html You can contact me at edjohnson@stic.net or 210 877-0855. " "The European Environmental Association has projected that with the rise of autism caused by toxic foods like Aspartame, MSG, Fluoride, and environmental degradation, by 2013 no one will be born in the Western World that does not to some degree have autism. My board of AAEM, American Academy of Environmental Medicine and Dr. William Rae, director of the Dallas Environmental Clinic agreed in open discussion at the October 2010 annual meeting." "The US government first licensed aspartame as a chemical warfare weapon, a brain washing agent. When I started using it I was so brainwashed by it, and addicted when people told me it was killing me I couldn't believe them. When I finally developed what looked like an ALS from it I went to a shrink because I was so depressed I wanted to kill myself, and he told me some chemical agent was doing this to me. So I got off of it and every study that I discovered on it showed it to be a horribly toxic poison and a potent abortifacient. It destroys human sexuality and fertility. After I got off of it, it took me two months to achieve apparent normalcy. I had no idea what big political foes I was stepping on until I was approached by an FDA Investigator who told me to stop immediately exposing aspartame and that I was endangering my career in life. I lost my home and my career and was left chemically hypersensitive, which leaves me chemically damaged whenever I'm exposed to chemical influences.
" I am presently partially paralyzed again and I've totally lost balance and stagger and fall at times. My bladder empties itself automatically without warning. Both in my own practice and personal contacts I see aspartame victims and they have no idea until I warn them. They are always very grateful to be alerted to what has caused their problem. Everyone involved with approval should be criminally prosecuted. EFSA should get its act together and release the truth not industry propaganda. Their concern should be with food safety, not loyalty to the manufacturer." "Over the past 51 years, I have practiced both as a pharmacologist and a retail pharmacist. In this capacity I became aware of the deleterious health effects of aspartame. For the last 16 years, I have lectured internationally, sharing and consulting with literally thousands whose health has been detrimentally affected by the use of products containing aspartame. "Research tells us that aspartame releases free methanol or methyl alcohol (wood alcohol) in any liquid. Methanol has a high toxicity in humans. Typically the toxic effects occur over time. Methanol can be fatal due to its CNS depressants properties or in a process of toxication, it is metabolized to formic acid leading to symptoms of hypoxia at the cellular level and also causing metabolic acidosis among a variety of other metabolic disturbances. "Additionally methanol poisoning can cause testosterone suppress which reduces sexual interest, pleasure and capacity. Aspartame damages the hypothalamus which also suppresses the formation of testosterone." "It would be appropriate to hypothesize that aspartame consumption has played a major role in the proliferation of erectile dysfunction. Is it any wonder that we now see 30 and 40 year old men requiring drug intervention to combat erectile dysfunction. The pharmaceutical manufacturers of Viagra. and Cialis have a love affair with Diet Coke and Diet Pepsi. "Consider the nightmare of drug interactions and deaths. These are discussed in Dr. H. J. Roberts medical text, "Aspartame Disease: An Ignored Epidemic" in great detail. These can also be found in Dr. Russell Blaylock's book, "Excitotoxins: The Taste That Kills". After decades of independent studies and public record after record no one has had the ability to get this deadly chemical off the market to the detriment of the public at large." "While working with the FDA, I regularly have seen the political influences of Pharmaceutical corporations as exemplified in the workings of the Food & Drug Administration. "After intensively studying the effects and processes of Aspartame, I realized this product exemplified political subversion of public health for profit. I also noted through review of this data, that a multitude of Food & Drug employees recommended further safety studies before this product (toxin) was approved. "It became apparent that the Food & Drug political appointees (managers) were consistently and continuously at odds with their own scientists. This was due to the FDA manager's fraudulent manipulation of data, and the suppression and concealment of the objective results, in order to subvert the approval process. "This fraud was perpetrated to provide positive outcomes to G.D. Searle (and Monsanto), and also with those Chemical-Pharmaceutical firms seeking approval, often with deadly consequences. This also occurred with medical devices and in other areas of FDA's laboratory and scientific investigations, rendering many of the FDA reviews, tainted and fraudulent. "Thus, the order of political procedure was to ignore G.D. Searle's own scientific studies (showing patho-physiological effects), and, subsequently, ignoring (other) later credible independent studies on the toxicity of Aspartame. This included the restriction of historical information regarding the three components of this product. Here, we see the political nature of Mr. Donald Rumsfeld, et al, appropriating influences to undermine or conceal many of the studies showing toxic side results. and isolated." Today Dr. Evangelista is Dir. Of Operations and Research, Public Health, Medical Fraud, Investigations. Another important issue EFSA must address is the methanol issue. Because this is free methanol, not bound to pectin or accompanied by ethanol (classic antidote for methanol toxicity) like in fruit and vegetables it converts to formaldehyde. The Trocho Study in Barcelona by Dr. Maria Alemany showed the formaldehyde embalms living tissue and damages DNA. No wonder aspartame causes so much cancer. The aspartame's manufacturer tried to assassinate Dr. Alemany's character. When I visited Dr. Alemany in Barcelona he told me, "Aspartame will murder 200 million people." Jim McDonald of the UK Aspartame Awareness Campaign says in the US the methanol is 44 times too high and 35 times to high in the UK. The severe problem of metabolism of methanol in humans was not taken into account when aspartame was approved. This is backed up by publicly available data on Methanol in the Material Safety Data Sheet (MSDS) and then some very simple arithmetic. While FDA toxicologist, Dr. Adrian Gross, admitted in Congress that aspartame violated the Delaney Amendment which forbids putting anything in food you know will cause cancer, he also said the FDA should not have been able to set an allowable daily intake for this reason. Now consider in order to calculate the ADI for a product intended for the food chain, a No Observable Adverse Effect Level (NOAEL) must be found in laboratory animals. The amount of product which produces "No Adverse Effect Level" is divided by a safety factor of 100 to give the ADI. For aspartame in the UK, 2 studies where rats were fed aspartame, resulted in an NOAEL of 4000mg/kg, divided by 100 gives an ADI of 40mg/kg. This ADI takes no account of the toxicity of methanol - NOTE: the lethal dose of methanol in humans is 343mg/kg. Mr. McDonald says if an adult ingested the methanol in the NOAEL of aspartame it would probably kill him. A NOAEL of aspartame in rats is NOT a NOAEL of methanol in humans. This issue cannot go unanswered. There have now been three Ramazzini Studies showing aspartame is a multipotential carcinogen and causes everything from leukemia and lymphoma to cancer of the liver and lungs. EFSA has tried to rebut them because as Dr. Koeter confessed they were pressured by industry. Aspartame caused cancer in original studies and it should be no surprise it causes cancer in independent studies. "The study released in the European Journal of oncology by Morando Soffritti and co-workers should terrify mothers and all those consuming aspartame sweetened products. This was a carefully done study, which clearly demonstrated a statistically significant increase in several types of lymphomas and leukemia's in rats. Both of these malignancies have increased significantly in this country since the widespread use of aspartame. "They also found an increased incidence of malignant brain tumors, even though it was not statistically significant. This does not mean there is no association to brain tumors, since only the animals exposed to aspartame developed the tumors. With children and pregnant women drinking the largest amount of diet colas, this puts their children at the greatest risk of developing one of these horrible diseases. Their study found that even low doses of aspartame could cause these malignancies; yet, the higher the dose, the more cancers that were seen. "Since aspartame can increase obesity and may even cause the metabolic syndrome that affects 48 million Americans, there is no reason to ever consume this product. At the least it should be immediately banned from all schools." EFSA received many of Dr. Blaylock's reports which are not on web in their spirit of "openness". "As a consultant internist and endocrinologist in the early 1980's, I encountered an increasing number of patients with problems and complications that had baffled the physicians. Careful observation revealed that many could be specifically attributed to the use of products containing the chemical sweetener aspartame by weight-conscious persons. This association was reinforced by the alleviation of symptoms after withdrawal of such products, and their prompt recurrence following re-challenge - despite intense corporate, bureaucratic and "peer-reviewed" denials. "This issue assumed enormous public health importance as aspartame products were being consumed by over half the population. Its manifestations included major neuropsychiatric afflictions ("refractory" headaches; seizures; confusion; dizziness; depression), the aggravation of diabetes mellitus, visual changes, paradoxic obesity, addiction, joint pains and hyperthyroidism...leading to extensive "negative" diagnostic studies and potentially hazardous interventions. "These observations were documented in scientific articles initially based on 100 patients and then 551 patients and subsequent books - including "Aspartame Disease: An Ignored Epidemic" presenting data involving 1200 cases. They emphasized high-risk groups that should specifically avoid aspartame products. The independent confirmation of my observations by professionals has been gratifying. Another important aspect of these studies was insight into the nature of many disorders, including Alzheimer's disease." Dr. Roberts in his many books on aspartame has exposed the original studies and the shenanigans pulled to market a chemical poison for human consumption. Consider the failure to challenge the manufacturer's contract with Universities Associated for Research and Education in Pathology (UAREP). This private group was engaged to determine the factual accuracy of prior aspartame studies - but with one stipulation that UAREP "shall not express an opinion" regarding either the design or safety significance of these studies, nor make recommendations about the safety of aspartame for human use. How outrageous can you get? G. D. Searle actually "swore them to silence"! They paid for this silence $500,000!! Richard A. Merrill was the FDA's Chief Counsel who requested a grand jury investigate the manufacturer for its alleged "concealing material facts and making false statements in reports of animal studies conducted to establish the safety of aspartame. He prophetically projected: "The FDA must receive the truth, not psychological warfare. To emphasize the importance of safety data on aspartame, we note that if ultimately approved for marketing, this sweetening agent can reasonably be expected to be part of the daily diet of every American." Through the political chicanery of Don Rumsfeld aspartame is now marketed throughout the world causing disability and death. Government agencies supposedly there to protect the people like EFSA have given their loyalty instead to the aspartame manufacturers. It's in your hands now, Parliament. Aspartame was never proven safe. This page contains a single entry by Sepp published on December 9, 2011 5:56 PM. Retroviral Talk: Is HIV Just in Lesions? was the previous entry in this blog. ALL the Vaccines Are Contaminated – Every Last One of Them is the next entry in this blog.